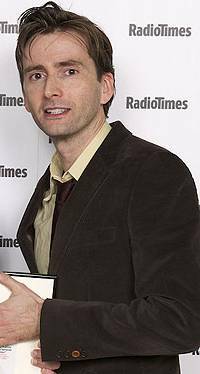 On the evening of Tuesday 26th January 2010 David Tennant attended the Radio Times Cover Party in London. This is an annual event that David has attended for the last few years. It is for people who have appeared on the front cover of the Radio Times Magazine during the previous year. For posts related to David Tennant at the Radio Times Covers Party on Blogger.com click here. "And now they're arguing over who's been on the most covers. Er, we think David wins that one..."
"Ooh...David Tennant and James Nesbitt having a nice old natter..."
"David Tennant comes up for his LAST EVER Doctor who cover. Sad!" "Very classy: David Tennant always acknowledges the band as he leaves the stage." "DT collects the Waters of Mars cover, then Ruth Jones and James Corden for G&S." "David Tennant collects the first Doctor Who cover! And very probably not the last..."
"David Walliams, Ben Miller, David Tennant, Outnumbered on stage. It's Tyger's birthday - many happy returns!" "Comic Relief covers mean a celeb fest on stage!" "I just stood next to David Tennant and didn't notice for a minute. A funny thing occured as this account, David_Tennant on Twitter re-tweeted some of the Radio Times' tweets and they then tweeted: "We just got excited when we mistakenly thought David Tennant was retweeting us- lucky we could check with the man himself. Thanks, David! :)"